Search engine optimization is the process of ranking for keywords. By leveraging content, building links, and optimizing your pages, you can continually drive relevant traffic to your site. It requires up front work but the payoff is magnificent: consistent, relevant traffic with 0 costs. ZERO?? Zero. The process can be as involved as you want it to be. You can spend years creating content, targeting keywords, and updating your blogs but with a few tricks you can get started. If you’re considering just dabbling in SEO, do it! You never know what will be the difference maker — try things, test them, and see what works. Title tags are crucial to search engine optimization. Insert keywords in your homepage tag to demonstrate to search engines that your website is relevant in your industry. Update your homepage title tag by navigating to Squarespace’s SEO settings. Modify the “Homepage Title Format.” This is your homepage’s title tag. Put your keywords at the front, use your brand at the end. Don’t go over 70 characters. For the overachievers: Do this for every page. To rank for keywords it’s vital to include them in your title tags! Keywords are the heart of SEO. A little research goes a long way in setting yourself up for success. With keyword research you can update title tags or target keywords with new blogs. 2. Enter a keyword related to your products or services. Press enter and you'll get a list of related keywords. 3. Copy the related keywords. 5. Paste your keywords with Ctrl + V on Windows or Command + V on Macs. 6. Click submit to see how often your keywords are searched. 7. Export and save this! This is super valuable information. You can create blogs or update your title tags with keywords from this document. Take a look at each website's Domain Authority (DA). The higher the DA scores, the more difficult it will be to rank well for this keyword. Websites like PongBoss.com (DA = 18) created excellent content to out-rank a powerhouse like Amazon (DA = 97). If websites with high DAs (like Amazon) dominate the SERP for your keyword, consider targeting a different keyword! Here's the gist: To achieve search engine success, target frequently searched, reasonably competitive keywords. Analytics is THE place to learn about website performance. With Analytics, you can take a deep dive into website traffic, where it comes from, and much, much more. Squarespace makes it pretty easy to setup. Headers break up your page’s content to simplify the user experience. Use keywords in headers to tell users (and search engines!) what your content is about. Simplify navigation. Headers make content stand out. They help users navigate (or scan) the page to find the content they are looking for. Help SEO (probably). Google understands headers and it’s likely your headers carry some weight (albeit small) in search engine rankings. Tip: Don’t jam too many keywords in there. For the overachievers: Each page on your site should target a keyword or set of related keywords. The title tag should contain the primary keyword target. Secondary keyword targets, however, make great candidates for headers. If you have tons of pages, get started by inserting keywords into headers on your homepage. Next do several other primary pages. You can always come back to do more! Receiving an inbound link is like someone recommending your website. If people (particularly the trustworthy and helpful ones) recommend your website, Google and other search engines take notice. If you know any webmasters (people who have websites), ask if they would be willing to link to your website. If not, there are numerous strategies to build links. Some are in-depth, time-sucking endeavors, others are simpler. Find a strategy that works for you and run with it! Google Search Console (formerly Webmaster Tools) is a gold mine for title tag optimization, keyword research, and tracking. You can view keyword rankings, clicks, and pages that drive organic traffic to your site. It’s pretty easy to get started. If you’ve got Google Analytics set up, you’re already well on your way. The next step is to set up Google Search Console. Update your title tags. 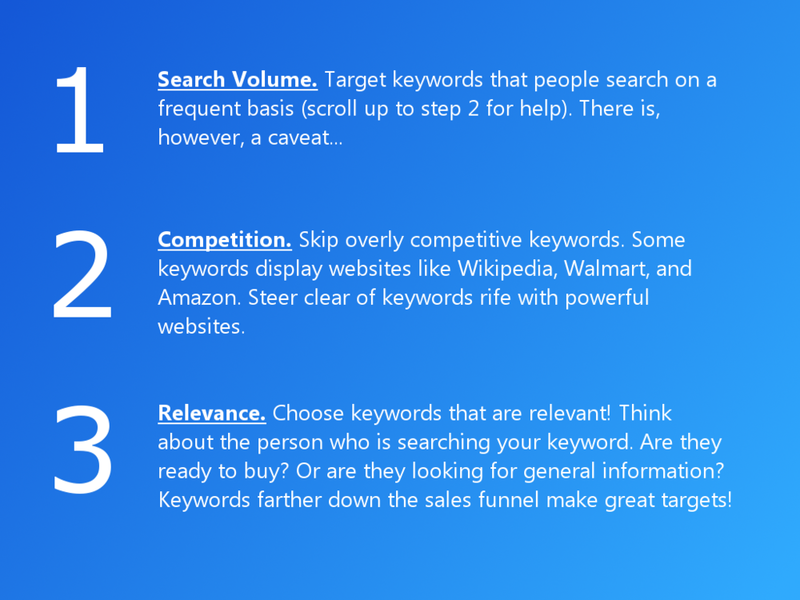 Look for relevant keywords you haven’t targeted yet. If you haven’t written about them yet, view step 2. If you have, update your title tags! Create new content. Write a blog or create a new page that targets this keyword. Think about what the searcher is looking for and create a page that gives them the answer, and then some. Robust, quality content is really important to rank for keywords. 7. Start writing a blog! It’s super easy to create a blog in Squarespace — no excuses, just start writing! The more blogs you write the more opportunity you have to rank for keywords. For the overachievers: Take the keywords you found in Step 2 (of this entire blog) and sort them by search volume. Google a couple of relevant, frequently searched keywords from your list and examine the search engine results page (SERP). Write a blog that targets keywords whose SERP contains smaller brands. If you downloaded MozBar in step 2, activate it and find a keyword who's SERP has low DAs (domain authorities). Those searches will be less competitive and easier to rank for. If you’ve gotten this far, give yourself a pat on the back! Or grab some comfort food...whatever it is you reward yourself with. For us, it’s flying our affectionately-named "Hell Pigs" and "Bernards." Newer PostWhy is User Experience Important?